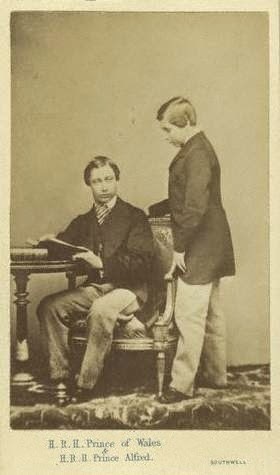 Born on 6th August 1844 at Windsor Castle, Prince Alfred was the fourth child of Queen Victoria and Prince Albert. In only four years! Poor Victoria! Still, the parents and the country rejoiced at having a “spare” heir should anything happen to Bertie, Prince of Wales. The two royal brothers grew very close. 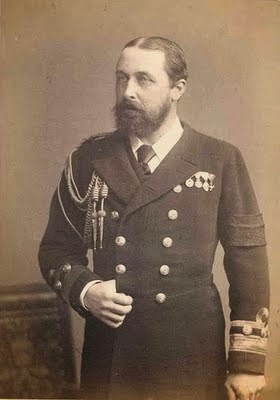 But while Bertie, growing up, wasn’t really allowed to do anything (Victoria didn’t trust him with affairs of government and any other job, including in the military, was precluded to the heir to the throne), Affie, as he was known in the family, was enrolled as a midshipman in the Royal Navy at the tender age of 13. Queen Victoria was sad at losing her son, but her husband supported Alfred’s wish and so she gave in. So, Affie embarked first on the HMS Euryalus, which took him to the cape of Good Hope and Australia (he was the first English prince to visit them), and then on HMS Racoon, and finally on the HMS Galatea, which he commanded. He remained in the navy for the next twenty years, attaining “only” the rank of admiral, much to his mother’s disappointmentl The Queen thought he should have risen higher. 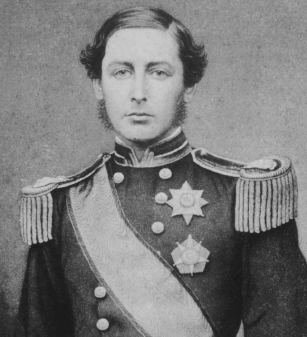 In 1866, Prince Alfred was created Duke of Edinburgh and granted by Parliament an annuity of £15,000. On 8 June, he took his seat in the House of Lords. In the meantime, his career in the navy continued and, in 1868, he once again went to Sydney. On his first visit, the Prince had been welcomed with open arms. But on the second, he was almost assassinated! The Prince was at a picnic at the beachfront suburb of Clontarf to raise funds for the Sydney Sailors’ Home when he was shot in the back by Henry James O’Farrell. The Prince recovered in a couple of weeks and went back home, while O’Farrel was hanged. On 23 January 1874, Alfred married the Grand Duchess Marie Alexandrovna, daughter of the Tsar Alexander II, at the Winter Palace in St. Petersburg. Unfortunately, the marriage wasn’t happy. Marie was considered haughty, and her generous dowry her only attraction. Alfred wasn’t perfect either. He drank a lot, loved money, had a bad temper, and was considered by many to be quite boring. Still, the couple did their duty and had six children: Alfred, Marie (the future Queen of Romania), Victoria Melita, Alexandra, and Beatrice. One of their children was, unfortunately, stillborn. It was rumoured, during his days in the Navy, that Affie had been offered the throne of Australia and refused it. 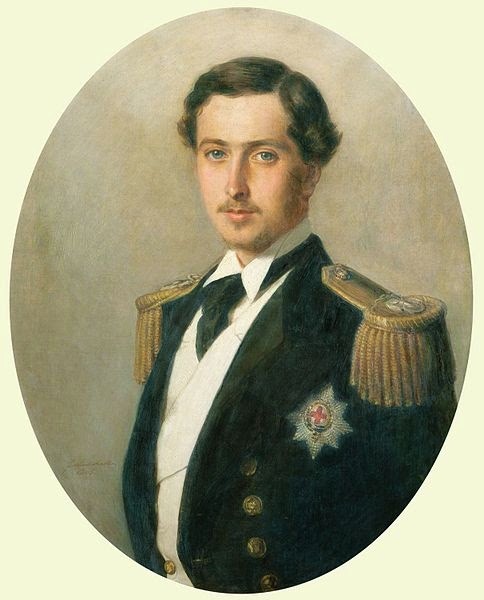 In 1862, after the abdication of King Otto of Greece, he was chosen to succeed him, but his mother and the British government were against it and nothing came of it. 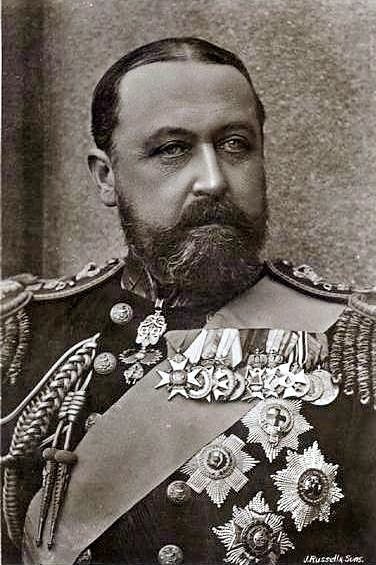 Instead, the Queen and Prince Albert, wanted him to succeed to the Duchy of Saxe-Coburg-Gotha. In 1893, he finally inherited it from his paternal uncle, but he didn’t rule it for long. After only seven years, on 30 July 1900, he died of throat cancer.